This cake was originally pitched to us as a holiday fruitcake—an upside-down apple cake with whiskey-soaked fruit. But we liked the idea of it for St. Patrick’s Day as well. The recipe, from Betty Crocker, was developed with Betty Crocker SuperMoist Yellow Cake Mix. But if you prefer your own homemade cake mix with butter instead of vegetable oil, you can make the cake from scratch. Prepare it in advance. You can prepare the dried fruit the night before, bake the cake layers, and/or whip up (and refrigerate) the topping the day before. Assemble the cake on the day you serve it. Single layer option. Instead of a layer cake, you can make two single layer cakes. Place a single cake layer, apple side up, on a cake stand. Top with a dollop of the mascarpone topping and garnish as desired. Substitute whiskey. You can use Bourbon or other whiskey instead of the Irish whiskey. 1. MIX dried cranberries, apricots, orange peel and bourbon in a medium bowl. Let stand at room temperature 1 hour or overnight. 2. PREHEAT oven to 350°F (325°F for a dark or nonstick pan). Generously grease bottom and sides of two 8-inch round cake pans with shortening. 3. LINE bottom of each pan with cooking parchment paper. Grease parchment paper with shortening. Line bottom and side of each pan with overlapping apple slices, cutting slices as necessary to line side of each pan. 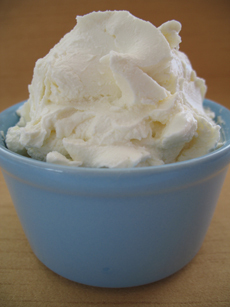 In the U.S., mascarpone is sold in eight-ounce tubs. Super-rich and thick, in Italy it is served with berries instead of the American favorite, whipped cream. Photo by Melody Lan | THE NIBBLE. 4. BEAT cake mix, water, ground almonds, oil and eggs with electric mixer on low speed until moistened, then on medium speed 2 minutes, scraping the bowl occasionally. Stir in soaked dried fruit and ginger. Gently pour into pans over apple slices. 5. BAKE 40 to 45 minutes or until toothpick inserted in center comes out clean. Immediately turn pans upside down to release cakes onto cooling racks. 7. MAKE filling: Beat mascarpone cheese, whipping cream and sugar with electric mixer on high speed until stiff peaks form. 8. 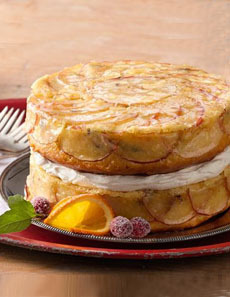 ASSEMBLE on a serving plate: Place one cake, apple side up. Top with whipped cream mixture. Gently place remaining cake layer on top of cream, apple side up. Garnish with fresh cranberries/arils and orange slices and toasted sliced almonds. Cut into slices with serrated knife. Cover and refrigerate any remaining cake. *Grind the slivered almonds in small food processor, or very finely chop with knife. †You can roll the raspberries in sugar—ideally superfine sugar—for a special effect.